You click on a link, wait for the page to load, start scrolling and then… you stop. The article is a “premium” article which means that you need to pay to see the rest of it. What do you do? Whatever you (as an online publisher) are showing a non-subscriber as a preview/excerpt of premium content can have a huge influence on whether or not that user decides to sign up and become a paying customer. It is, after all, the last thing the user sees before he/she either signs up or heads back the previous page or website. So, what’s the best taster or sampler to display in order to get people interested and a little bit deeper into the story without giving too much away — so they feel they just need to pay for your content? Another approach is to show almost absolutely nothing. Here the users gets a very small part of the content (maybe an image, a header or something like that) and then either a button or form urging you to sign up. Nada más. I must confess that I haven’t really done any other research on this subject than my usual browsing around … and not signing up to a lot of websites. But I feel that these two approaches really aren’t enticing me into signing up. (There is another dimension to this, which I’ll touch briefly on before continuing: Freemium vs. premium websites. Freemium websites allow you to access some of the content (usually news content) for free, whereas content which takes longer to produce (and sometimes to consume) are placed behind the ‘paywall’. A premium website, on the other hand, keeps all of its content behind the wall. Medium is freemium (since you’re reading this for free but would have to become a paying member to read the New York Magazine article above) and the online tech magazine The Information is premium. In the fields of innovation and development (especially digital development) there has been a growing focus on the user in recent years. This has namely resulted in a ‘UX’ movement which treats the User Experience (abbreviated UX) as a the most important thing in a product, service etc. In an article written for UX Planet titled ‘The Golden Age of UX is Over’, Jonathan Courtney labels the period from circa 2010 to 2017 “the golden age of UX”. Out of this (or in tandem with this, I’m not 100 percent sure), an interesting way to look at the user’s perspective has appeared, labeled the ‘Jobs To Be Done’ approach. A good place to start is a 2016 Harvard Business Review article, ‘Know Your Customers’ “Jobs to Be Done”’ by Clayton M. Christensen, Taddy Hall, Karen Dillon and David S. Duncan. Long story short, Jobs To Be Done is about slicing our everyday life into tiny tasks (or jobs) which we then “hire” products or services to solve/get done. Let’s say you need to get up at 7am tomorrow. You would probably hire your alarm clock (or you phone) to wake you up. Or maybe you need a snack at 3pm to keep you from falling asleep at your desk. Some people hire a candy bar while others may hire something healthier, like carrots. These examples aren’t really related to the subject of this article, but they illustrate the underlying concept in the approach. So, to turn our focus back to premium content, let’s find out what jobs our users have where they “hire” our content to solve it for (or help) them. This is ideally not something you should discuss and settle on with your colleagues during a 5 hours workshop — it’s much better to talk to and ask your users. Once you have found out why people come to your premium content (but perhaps aren’t signing up because the first paragraph of an article might not be the best selling point…) you can address this in your previews/excerpts to non-subscribers. Get an easy to understand introduction to who’s who in the Trump administration. See who has been removed or resigned from their posts since Mr. Trump’s inauguration. Be able to share the article with 10 of your friends. Understand how and why tech companies are trying to remove right wing extremist from the internet. 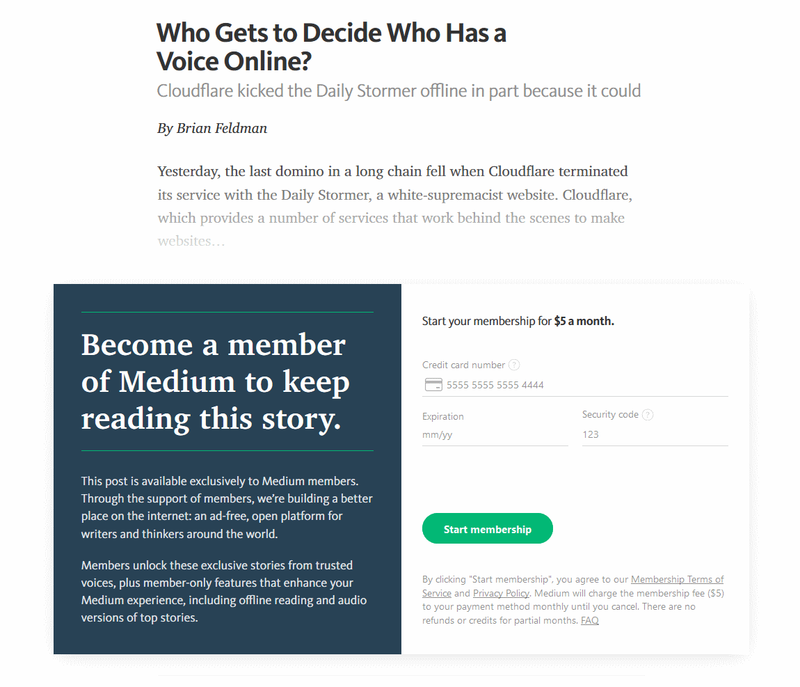 Learn why Cloudflare (a web performance and online security company) terminated ‘The Daily Stormer’ and why its CEO calls that takedown “dangerous” [he actually did, according to Ars Technica]. Hear our opinion on why this might set a dangerous precedent on who gets to speak online [I have no idea whether that’s in the article, so don’t take my word for it]. I am far more likely to sign up if I’m presented with Option A because that description actually tells me something about what I will get out of that piece of content — will it help me get my job done? Option B really only tells me how the article begins… not quite something I will take into consideration when I am to decide whether to pay or to hit the back button (I did the latter, in case you’re wondering). I think this is a pretty straightforward and hands-on way of implementing the Jobs To Be Done practice into our journalism and into how we present our premium content to our users. We need to remember that this is more about our users and customers and less about our content. A journalist working as Head of Product Development and writing on journalism, tech and digital development.